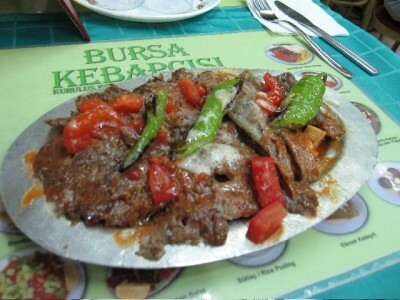 According to the website of its registered trademark holder, Kebapçı İskender , it was a moment of great culinary revelation when the ingredients of İskender kebap first came together on a plate in Bursa back in the late 19th century. 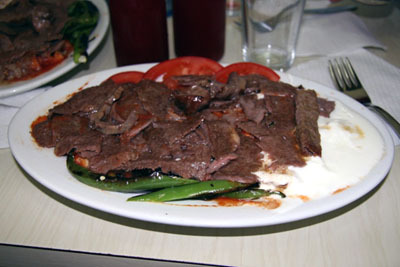 But we imagine this kebab’s creation as an elaborate ploy to trick a finicky child into eating his vegetables. After all, who wouldn’t gladly eat chopped tomatoes and peppers when served over succulent strands of grilled lamb that are laid atop a flatbread soaked in tangy salça and alongside a cool dollop of yogurt, the whole thing doused with fried butter? Is it delicious like, say, chili cheese fries or pizzagna? Definitely. Inspired like a chocolate soufflé? Hardly.